Responding to the growing problem of water scarcity, treated wastewater is now commonly used as a reliable water substitute for various applications including irrigation. The expanding needs for water – both in terms of good quality and quantity – render reuse an urgent necessity. Today, sustainable and safe urban water cycles have become one of the top policy agendas of many countries worldwide. In Europe, the European Cooperation in Science and Technology (COST) Action aims to consolidate existing scattered data related to water reuse and addresses the open challenges associated with it. A new group within the COST Action programme, the NEREUS COST Action, was recently established to focus on new and emerging challenges and opportunities in wastewater reuse (ES1403). 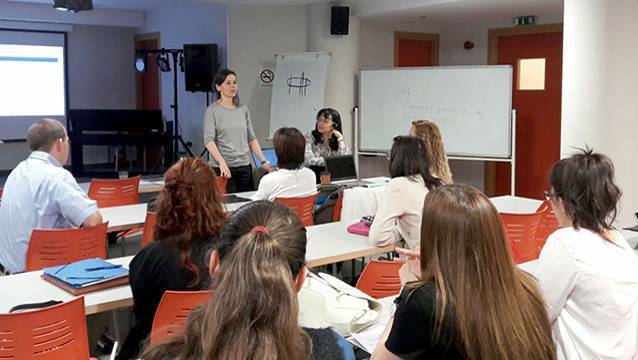 At a NEREUS COST Action meeting (24–25 April 2017) at the Cyprus University of Technology in Limassol, Cyprus, UNU-FLORES researcher Serena Caucci (Waste Management Unit) joined experts in discussing the latest risks and opportunities around the use of wastewater. Existing challenges include, among others, the evolution and release of antibiotic resistance and a lack of efforts promoting safe reuse practices. To mitigate negative environmental and human impacts, regulatory frameworks are required, based on validated scientific information. Particularly in relation to wastewater irrigation, there is generally a lack of knowledge on the associated environmental risks. Furthermore, a methodological gap in environmental risk assessment of wastewater irrigation also exists within the European context. To date, these issues have not been considered collectively, and especially not in relation to the practice of wastewater use. Organised by the Blue Circle Society, the Cyprus meeting aimed at supporting the preparation of deliverables and acted as a think tank for the significant gaps-of-knowledge within COST Action. Together with the organisers Dr Marlen Vasquez, Dr Heidemarie Schaar, and Dr Despo Fatta-Kassinos (COST Action Chair, Nireas International Water Research Center, University of Cyprus), the two-day meeting provided good ground for fruitful collaboration. New steps have also been paved towards the achievement of the sustainable use of wastewater. All these developments are in line with the NEREUS COST Action’s goals and objectives, among which is the provision of a platform for a systematic consolidation of data and standardisation of methods for assessing emerging hazards associated with reuse.